For five years I have owned a 1990 Outrage 22 Whaler Drive that came from the factory powered by 1990 Mercury 135-HO twin engines. The splashwell drains have always been submerged. Last year the 1990 OUTRAGE 22 Whaler Drive boat was re-powered with twin Suzuki DF140 engines. Naturally, the engine splashwell drains are still submerged. After waiting two years, a slip has finally come available at our town marina. The hull now has five layers of barrier coat and two coats of bottom paint. Can additional buoyancy be added to the hull to get the drains above the waterline? If this isn’t feasible should the splashwell get barrier coat and bottom paint as well? If the batteries [in the OUTRAGE 22 Whaler Drive boat under discussion] are in the stern, moving them to the console will [increase freeboard in the stern]. Adding ballast to the bow will to the same. [Some unidentified described on as] boat has always been low in the stern. ASIDE ON A NEW AND UNRELATED TOPIC: What is top speed with the Suzuki DF140 engine compared to the Mercury 135-HP engines? If the splashwell of the OUTRAGE 22 Whaler Drive will always have some seawater due to the drains being below the static waterline, applying a barrier coat to the splashwell of the Whaler Drive sounds like a reasonable idea. I don't know if anti-fouling paint will be useful. If the boat is being left in the water in an area with very aggressive marine growth, it might be necessary. Much would depend on the water temperature and where the boat is being kept. Is the boat in saltwater? Is the boat in tropical saltwater? Is marine growth a significant problem in the area? hou2bos wrote: Can additional buoyancy be added to the hull to get the drains above the waterline? Buoyancy always comes from displacement of water. In order to increase the buoyant force produced by the hull you will have to immerse more of the hull into the water. This means you will have to increase the draft of the hull at the stern. You will have to add more hull form to the underwater parts of the hull bottom in the stern and to the bottom of the Whaler Drive. I don't recommend you undertake a modification to the hull form like that. Since there is really not a practical way to alter the hull form, the other approach to reducing draft in the stern is to remove weight from the stern. Remove as much gear from the stern as possible. Heavy items like lead-acid batteries are a good start. Look for other heavy gear to be moved out of the stern. What fuel tank is on the OUTRAGE 22 Whaler Drive boat under discussion? If the boat was originally rigged with twin engines, perhaps it was rigged with the larger fuel tank, a 129-gallon monster. In the days of outboard engines having brake specific fuel consumption of 0.6-lbs/HP-hour, a large tank like that was probably welcomed. With modern engines that might consume fuel at only around 0.45-lbs/HP-hour, less fuel tank capacity is probably easily tolerated. If you have the 129-gallon tank, consider a re-fit with a smaller volume tank, and move the tank to the extreme forward end of the fuel tank cavity. This will reduce total weight and move a considerable weight out of the stern of the boat. The batteries are in the console and the OUTRAGE 22 WD is equipped with the 77-gallon fuel tank. I’ll give a week or so and check for growth in the splashwell. I have leftover paint if need be. 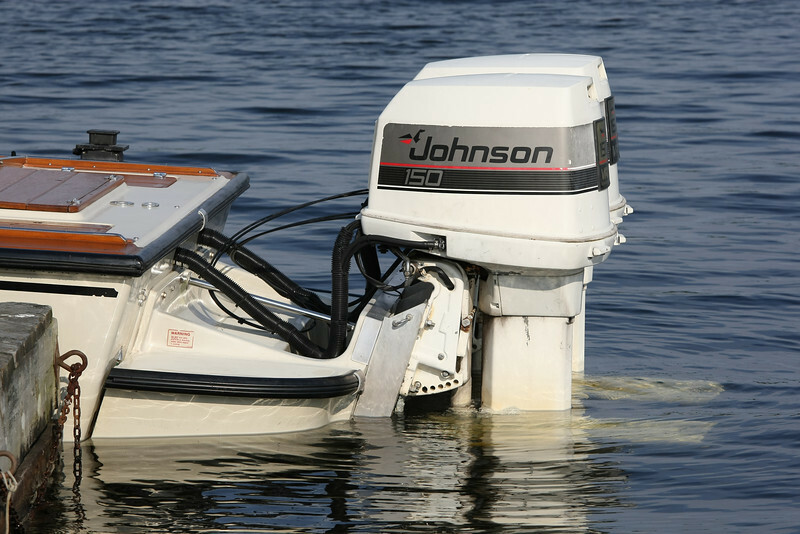 For when the boat is being left in the water at a slip or mooring, you might try moving a big cooler right to the bow and filling it with water. Perhaps that much weight shifted forward could get the Whaler Drive splashwell drains high enough to keep the splashwell dry while the boat is not being used. Then you can easily drain the water from the cooler onto the deck and eventually overboard when you want to use the boat. As for adding some permanent ballast in the bow to correct the static trim, I would be hesitant to do that. The bow will have the most pitching motion, and added weight there might tend to make the bow really slam down hard in head seas. I have a 22-foot hull with Whaler Drive. It's a REVENGE, so there is some added weight forward from the cabin top. The boat has a single engine. The splashwell drains are well above the static water line. Two adults can stand on the Whaler Drive, adding maybe 400-lbs to the stern weight, and the splashwell is still dry. 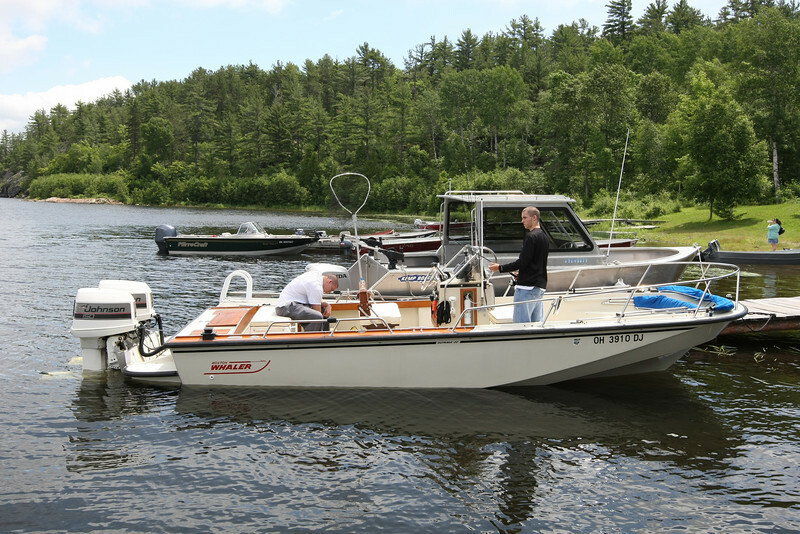 I have seen a Boston Whaler commercial 22-foot hull with Whaler Drive and twin engines (on a law enforcement boat), and it did appear to be sitting rather low in the stern. I don't recall exactly where the drains were, but there was not much freeboard on the Whaler Drive. This may be typical for the open cockpit OUTRAGE style boats. You can get a appreciation for the freeboard that remains on the Whaler Drive from the image inked above. In addition to the twin engines, the boat shown above has jack plate brackets which probably add another 50 to 80-lbs on the transom.